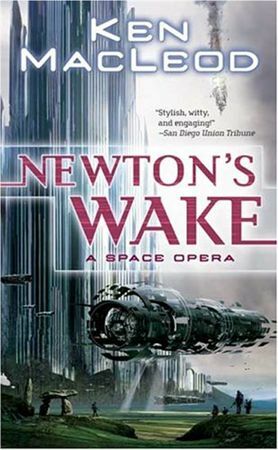 Newton’s Wake by Ken MacLeod has some good ideas and interesting characters within it’s pages but in the end it can’t find an ending or a villain to cheer for when the good guys possibly win the day. Taking place in the future where singularities, faster than light travel and backing yourself up before going out on a dangerous mission the story is quite simple: A group of combat archeologists find a world named Eurydice that was cut off from Earth after a devastating war and bit by bit everyone from Knights of Enlightenment to AOL Off Line to the Korean Republic to intelligent machines show up. The beginning of it turns out rather well, one of the archeologists, Lucinda Carlyle is captured and separated from the group and is introduced to a culture around her. Turns out her family owns a expanse called the Skien that allows for wormhole travel. Along the way two musicians are raised from the dead at the request for a promoter so he can produce one of his off the wall musicals that from the sound of it could have been a book all by their own. With the news of Earth still existing he sees the flavor of the month. Somewhere along the way the evil war machines someone should be worried about finally show up and then and….I suddenly I realized by the time I got three quarters of the way through this book and I did not care. This entry was posted in Books, Reviews and tagged book reviews by RK Bentley. Bookmark the permalink. Pingback: first person shooter | city in the sky | is 2012 real? ← Previous Previous post: [SDCC] Oh, the Nerd Prom carnage…oh the humanity!